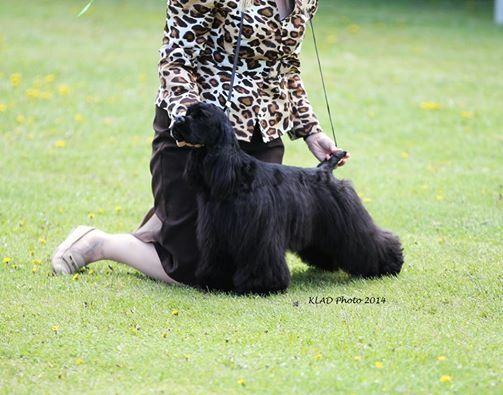 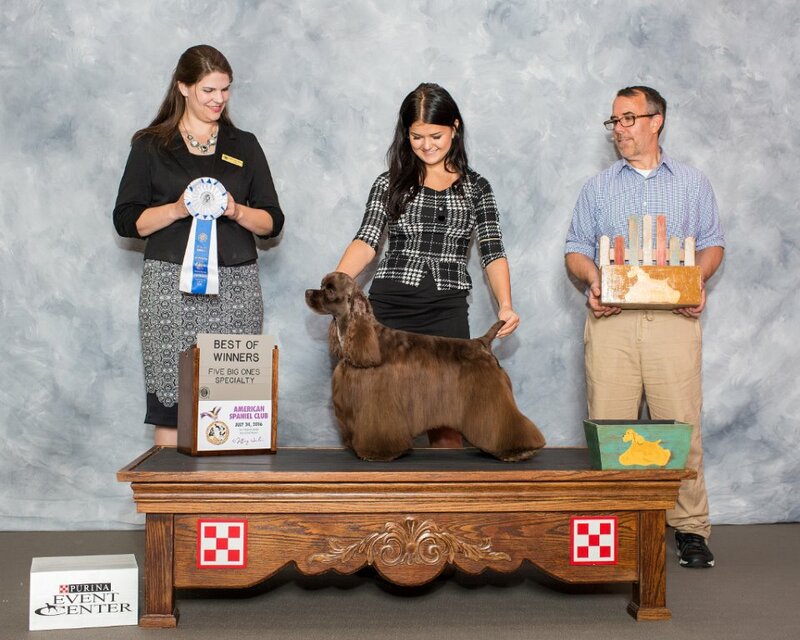 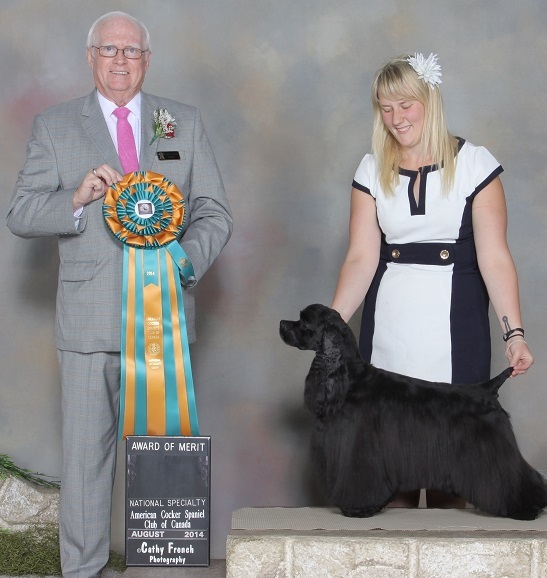 Lars (GChEx, Am Ch Braewood Grand Larceny CGN) also won Best Veteran in Sweepstakes at the American Cocker Spaniel Club of Canada National Specialty Show in Saskatoon, on August 30, 2014 under Judge Doris Koeneman and very well shown by handler, Cassidy Proctor. 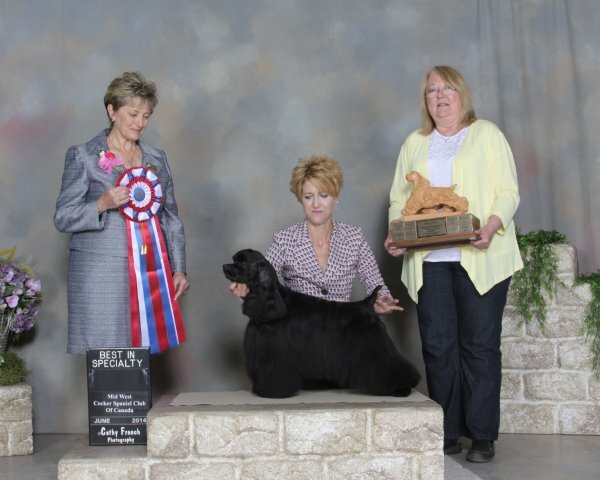 We are thrilled over Judge Billie Hayes' selection of Lars (GChEx, Am Ch Braewood Grand Larceny CGN) as Best in Specialty Show at the Midwest Cocker Spaniel Club of Canada on May 26, 2014 in Edmonton, Alberta. 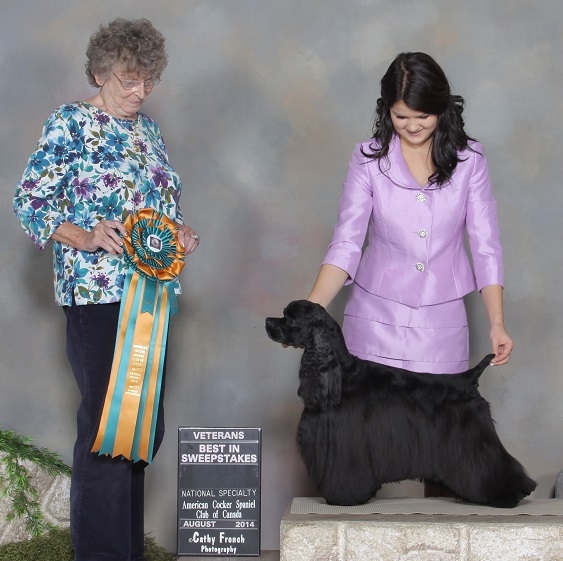 At 10 years of age, Lars remains in top form and still loves to show for his handler, Lori Gauvin. 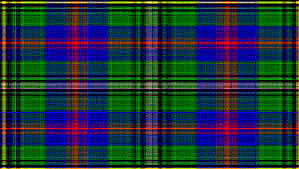 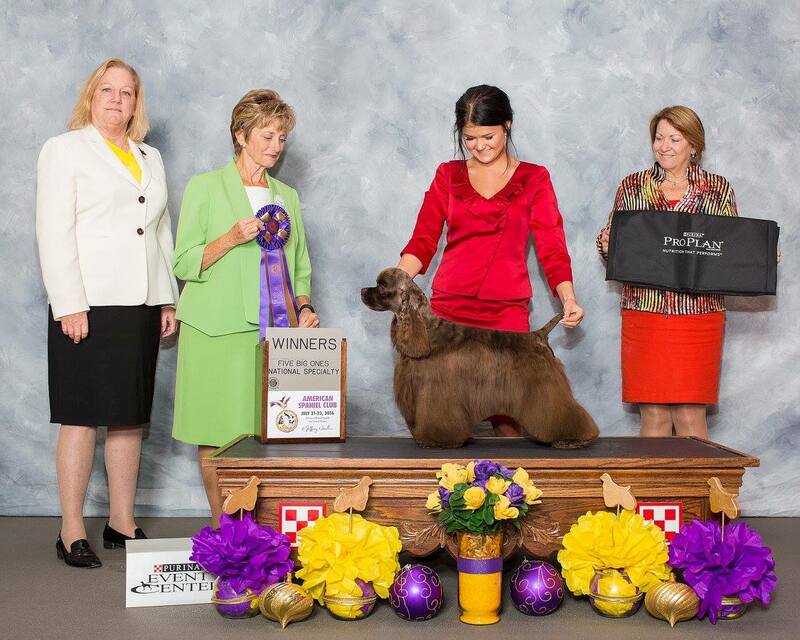 (Click on picture for pedigree). 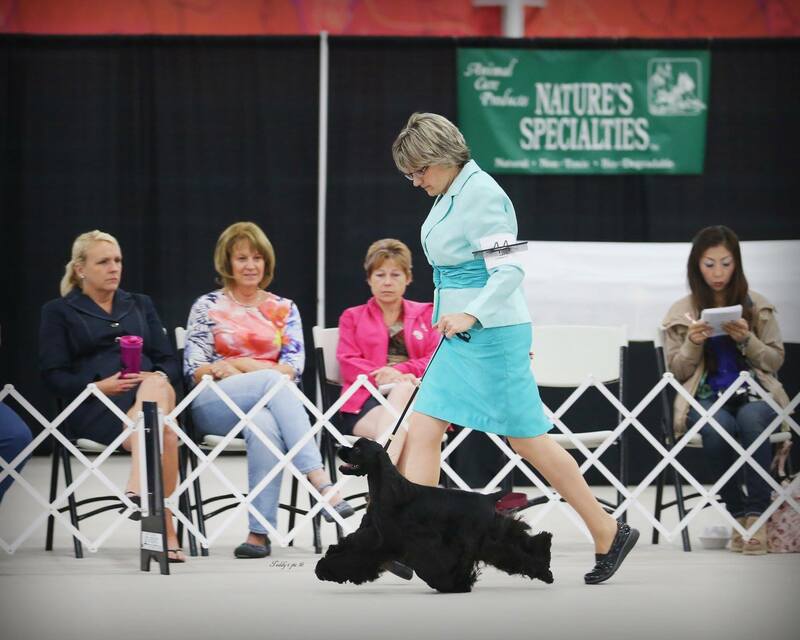 At the same show, his great grandson, Seann (Braewood Seann Triubhas) was Best Baby Puppy in Show at 3 1/2 months of age and at his very first show, judged by Billie Hayes ansd shown capably by Jackie Forchuk! 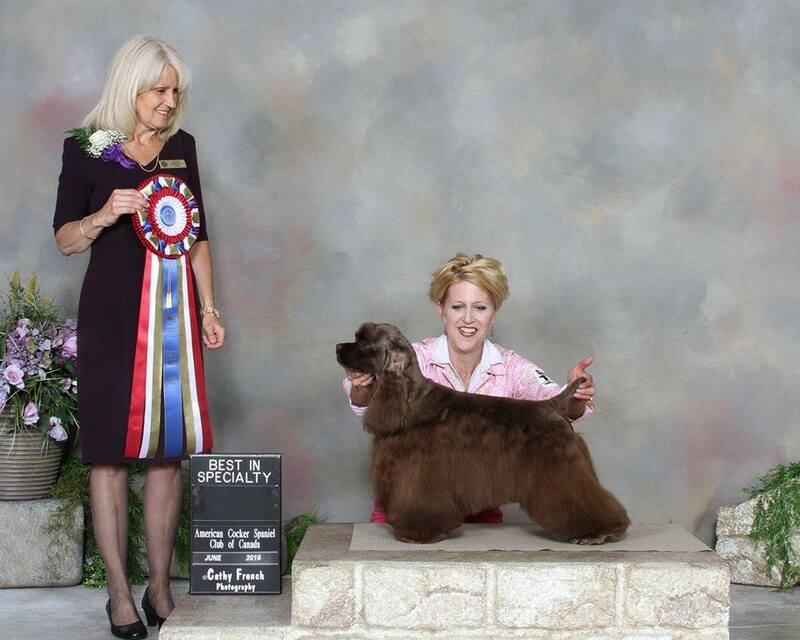 (Click on picture for pedigree). 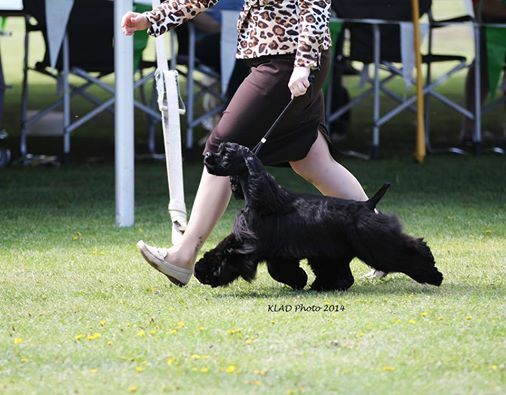 In this video clip of the Baby Puppy Class, Seann (Braewood Seann Triubhas) and Johnny (Highland Laddie) are handled by Jackie Forchuk and Lori Gauvin respectively and are shown going around the ring with the others in their class at the Midwest Cocker Spaniel Club Specialty on June 1, 2014. 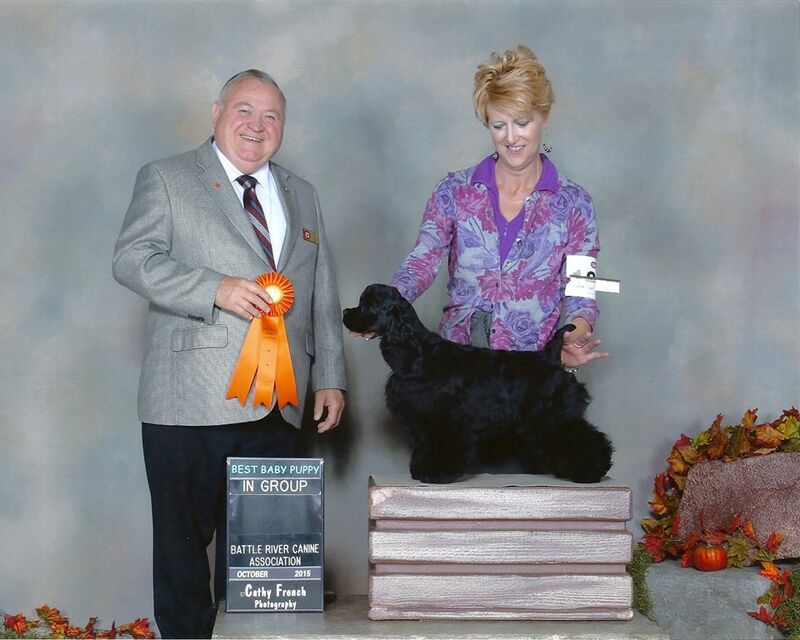 Judge Billie Hayes awarded Seann first place and Johnny second place. 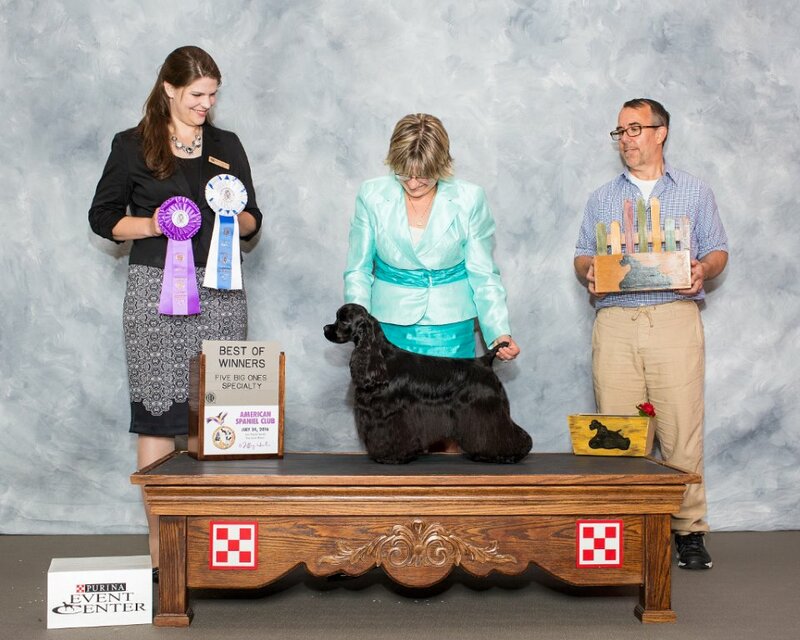 Another win for Braewood dogs at the same Midwest Cocker Spaniel Club Specialty Show was top scoring dog in agility, won by Braewood Protector of Zion (Neo) shown by his owner handler, Sandi Maday. 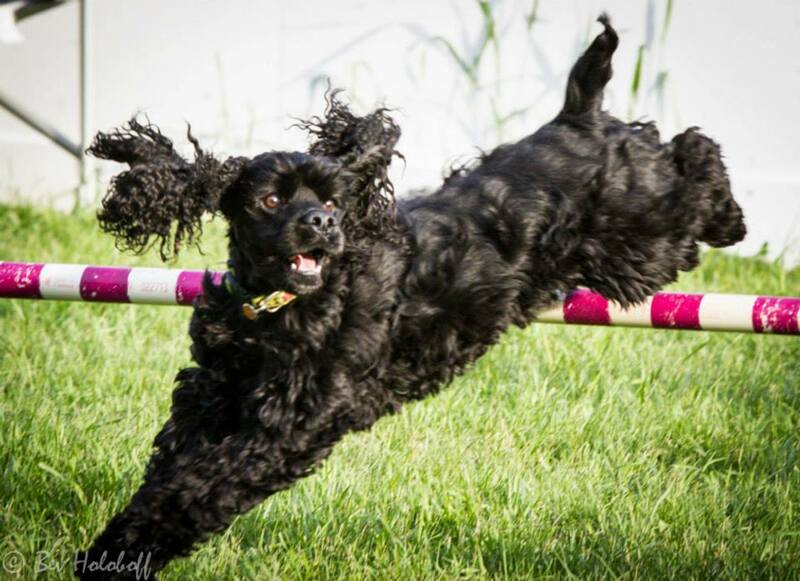 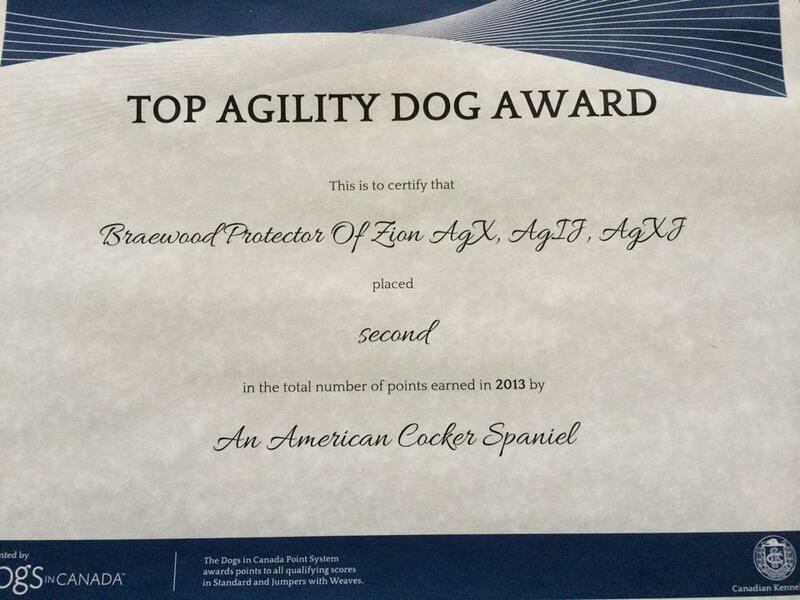 And Neo also recently won the status of second-ranking cocker spaniel in agility in Canada in 2013! 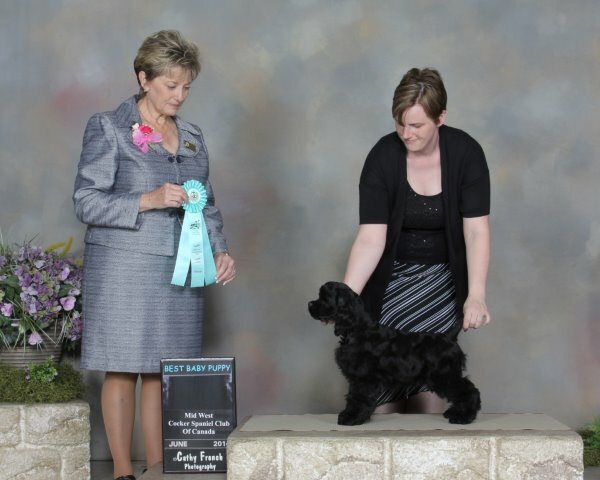 In his second weekend on the dog show circuit, Tricep Braewood Petty Larceny "Dodger" (owned by Brad Sharpe and Marnie Wood) won Winner's Dog in three all-breed Northern Alberta Canine Association shows as well as in both specialties (Midwest Cocker Spaniel Club Specialty Show on Saturday, June 1 and American Cocker Spaniel Club of Canada Regional Specialty Show on Sunday, June 2, ,2014!) 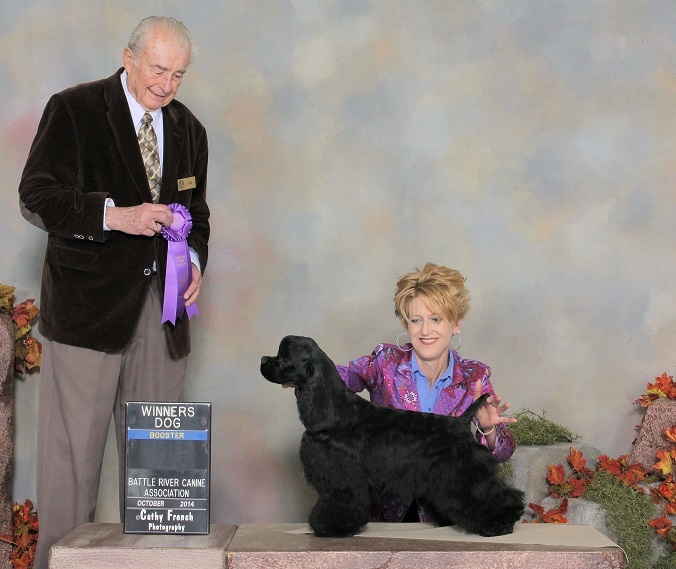 under three breeder judges, Billie Hayes, Pierre Talbot and Jean Delisle. 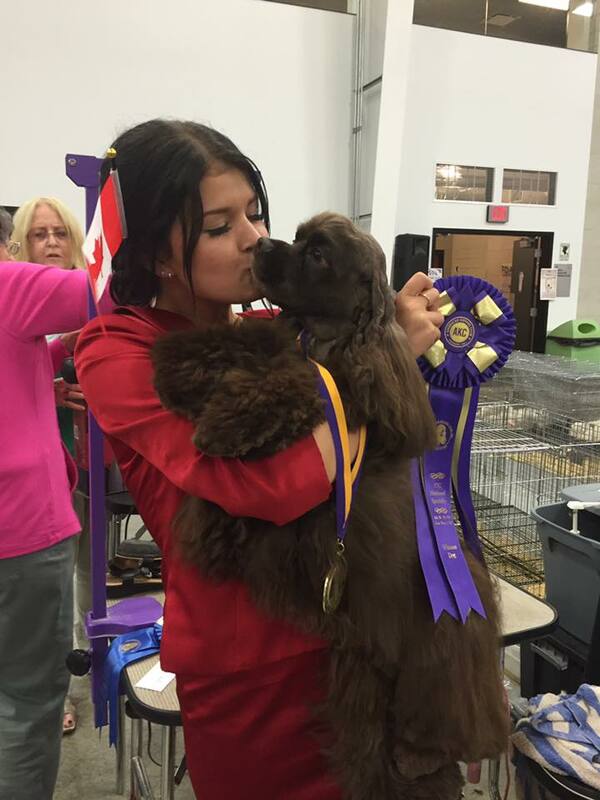 He thus finished his Canadian championship in style! 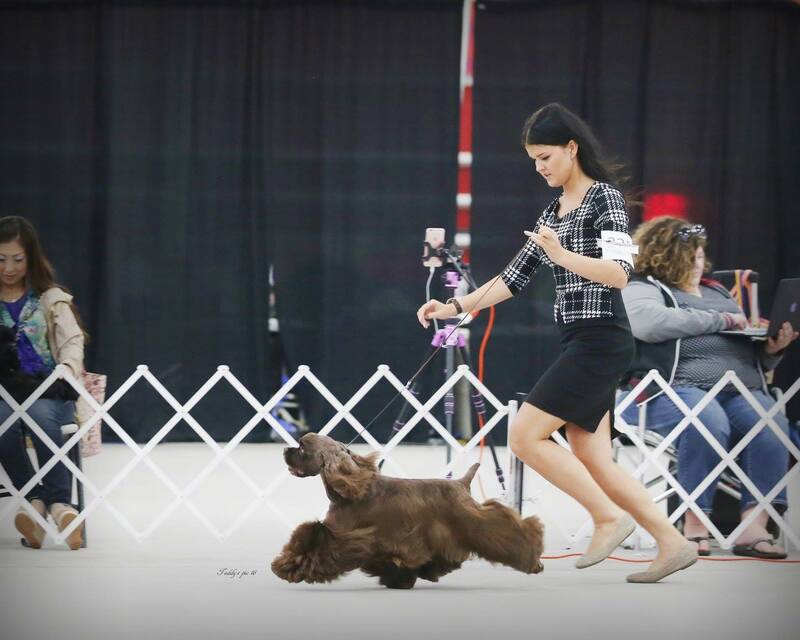 Dodger in the ring at NACA all-breed show with handler Alyssa Nicole.